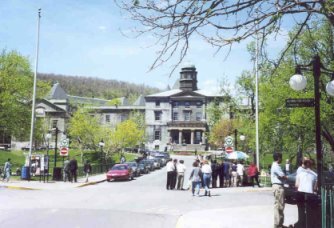 Established in 1821, McGill University is an English-language university located in the city centre of Montreal, Quebec, Canada. 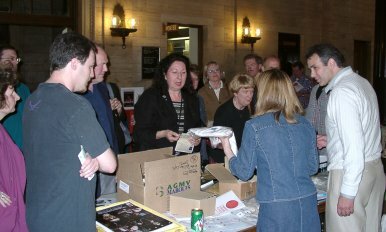 Moyse Hall was the main site for The Leonard Cohen Event. Donna and Geoff Compers receiving attendants at the registration desk in Moyse Hall. Liz Madder and Ray Webster (UK) get their Event Pack - the program booklet, the Event ring, and the pin of The Order of the Unified Heart, both gifts from Leonard. For more info, check the Event Memorabilia page. The official Event T-shirt and the Event poster were also available. Event guests getting together before the official opening. 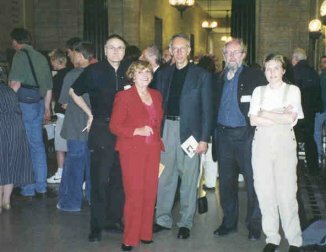 Yvonne Hakze (editor of the Intensity fanzine, from Holland, on the right), professors Stephen Scobie and Ira B. Nadel, Ms. Esther Cohen, Leonard's sister, and Jarkko Arjatsalo. Bill Van Dyk opened the Event at 7 pm, and after his welcome speech Kelley Lynch, Leonard's manager (on the left), and Leanne Ungar, Leonard's sound engineer, forwarded Cohen's greetings to The Event. They played three songs from Leonard's next album: "My Secret Life", "Here It Is", and "A Thousand Kisses Deep". Attendees witnessed the world premiere of these beautiful new songs. 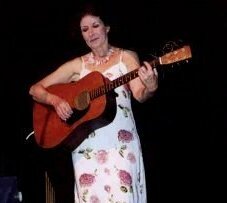 Nancy White, the famous Canadian singer live on stage with Bob Johnston and her special guest star Matt Zimbel. They were doing several Leonard songs, some songs about Leonard (including Leonard Cohen's Day Job, by the Texas Lounge Lizards, and Nancy's own songs Leonard Cohen Is Never Gonna Bring My Groceries In, and Get Down Offa That (Mount Baldy - and he did!!). She also sang some of her own hilarious songs which have some connection with Leonard (He Wrote Too Many Songs About His Girlfriend for instance). 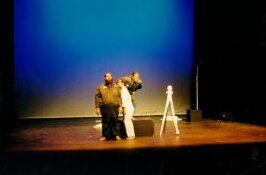 Aaron Kahn and his group The Laboratory for Enthusiastic Collaboration (LEC) presented the drama based on Cohen's ambiguous novel The Beautiful Losers. Starring Barbara Whitney (Catherine/Edith), Ira S. Murfin (Playwright/Narrator), Paul Wolfe (F.). Directed by Aaron Kahn. 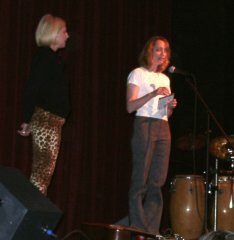 Amy Davis (manager and designer). Afterwards the drama company spent the weekend at the Event, collecting comments and ideas for future versions of the play. © by Calvin Van Eek. Used by permission.